The Mahler Chamber Orchestra (MCO) was founded in 1997 based on the shared vision of being a free and international ensemble, dedicated to creating and sharing exceptional experiences in classical music. With 45 members spanning 20 different countries at its core, the MCO works as a nomadic collective of passionate musicians uniting for specific tours in Europe and across the world. The orchestra is constantly on the move: it has, to date, performed in over 40 countries across five continents. It is governed collectively by its management team and orchestra board; decisions are made democratically with the participation of all musicians. The MCO’s sound is characterized by the chamber music style of ensemble playing among its alert and independent musical personalities. Its core repertoire, ranging from the Viennese classical and early Romantic periods to contemporary works and world premieres, reflects the MCO’s agility in crossing musical boundaries. The orchestra received its most significant artistic impulses from its founding mentor, Claudio Abbado, and from Conductor Laureate Daniel Harding. Pianist Mitsuko Uchida, violinists Isabelle Faust and Pekka Kuusisto, as well as conductor Teodor Currentzis are current Artistic Partners who inspire and shape the orchestra during longterm collaborations. In 2016, conductor Daniele Gatti was appointed Artistic Advisor of the MCO. Concertmaster Matthew Truscott leads and directs the orchestra regularly in its performances of chamber orchestra repertoire. MCO musicians all share a strong desire to continually deepen their engagement with audiences. This has inspired a growing number of offstage musical encounters and projects that bring music, learning and creativity to communities across the globe. Feel the Music, the MCO’s flagship education and outreach project, has opened the world of music to deaf and hard of hearing children through interactive workshops in schools and concert halls since 2012. MCO musicians are equally committed to sharing their passion and expertise with the next generation of musicians: since 2009, they have, through the MCO Academy, worked with young musicians to provide them with a high quality orchestral experience and a unique platform for networking and international exchange. In recent years, the MCO’s major projects have included the award-winning Beethoven Journey with pianist Leif Ove Andsnes, who led the complete Beethoven concerto cycle from the keyboard in international residences over four years, and the opera production Written on Skin, which the MCO premiered at the Festival d’Aix en Provence under the baton of composer George Benjamin, performed at the Mostly Mozart Festival in New York and toured, as a semi-staged concert production, to major European cities. In 2016, the MCO and Mitsuko Uchida launched a multiple-season partnership centred on Mozart’s piano concertos. Upon the conclusion of a complete cycle of Beethoven symphonies, the MCO and Daniele Gatti continue their focus on Robert Schumann’s symphonic work. 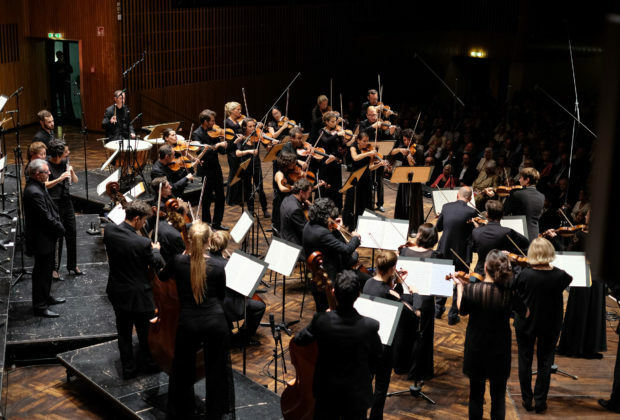 The Mahler Chamber Orchestra’s 2018/19 season begins with its annual residency at the Lucerne Festival. In the first half of the season, the MCO embarks on an extensive ten-concert European tour with acclaimed conductor Gustavo Dudamel; highlights the oeuvre of composer George Benjamin with performances at Berlin’s Philharmonie and Elbphilharmonie Hamburg, most notably of his masterpiece, Written on Skin; welcomes a new generation of young musicians at the MCO Academy under the direction of Andrés Orozco-Estrada; and performs two innovative programmes led by concertmaster Matthew Truscott and Artistic Partner Pekka Kuusisto. The Mahler Chamber Orchestra was awarded the Special Mention Prize of the German Design Award 2017 in recognition of its brand identity.